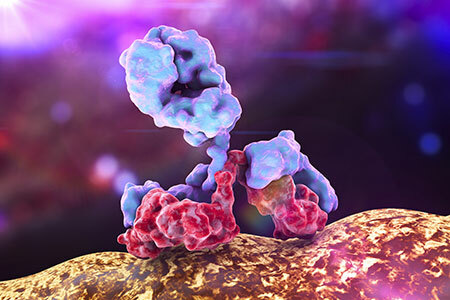 What do Rituximab, Trastuzumab, and numerous other cancer immunotherapies have in common? Their anti-tumor efficacy involves the potent tumor-killing activity of natural killer (NK) cells. The induction of antibody-dependent cellular cytotoxicity (ADCC) in NK cells forms the basis for many important ongoing clinical efforts. These efforts are being aided by humanized immune system (HIS) rodent models, which offer an improved in vivo system for translating therapies to the clinic. According to Dr. Sebastien Tabruyn, Chief Scientific Officer at TransCure bioServices, "many Biotech and Pharmaceutical companies are currently developing antibodies to specifically utilize the cytotoxic potential of NK-cells for the elimination of cancer cells". Although excellent in vitro systems exist to study aspects of NK-cell function, improved in vivo systems are needed to help translate NK cell-mediated therapies to the clinic. Supporting this claim, Dr. Tabruyn stated that researchers "need to have access to humanized mouse models where NK cells are sufficient and functional". Super-immunodeficient models, like the CIEA NOG mouse®, support the engraftment of human NK cells for ADCC studies. New HIS models have built upon the super-immunodeficient platform, leveraging human cytokines to support the development and survival of human NK cells (Table 1). These advanced HIS models offer improved systems for studying NK cell biology and related therapies. In 2010 Shiokawa et al. described an in vivo assay of human NK-dependent ADCC using the super immunodeficient CIEA NOG mouse1. NOG mice previously engrafted with a Burkitt's lymphoma cell line, were administered Rituximab with or without intravenous injection of isolated human NK cells. Rituximab suppressed tumor growth only in mice carrying human NK cells, supporting the utility of this model for ADCC investigations. Shiokawa and colleagues' approach has several benefits, such as allowing for isolation of NK cell activity in efficacy studies and extensibility to various tumor types, stemming from use of the NOG host. However, lacking supporting human cytokines signals, human NK cells engrafted into NOG mice are lost within one week. Enhancing the long-term maintenance of human NK cells remains a focus for improvements in related models. Within sixteen weeks NOG mice injected with human CD34+ hematopoietic stem cells (HSCs) develop a partially intact human immune system. Lacking support from important human cytokine signals, human myeloid cells and NK cells are significantly underrepresented in HSC-engrafted NOG (huNOG) mice. Second generation NOG-EXL mice, which transgenically express human IL-3 and GM-CSF (hIL-3, hGM-CSF), enhance the development of myeloid cells and NK cells, following HSC engraftment. Myeloid lineage cells are significantly increased in HSC-engrafted NOG-EXL (huNOG-EXL) mice, but the effects from hIL-3 and hGM-CSF on NK cells is small and total NK cell numbers remain low. The enhanced myeloid differentiation in huNOG-EXL mice clearly indicates that select human cytokines can enhance immune lineage reconstitution. Leveraging this principal, Dr. Tabruyn's team enhances the huNOG model for NK cell research using hydrodynamic injections to deliver human IL-15 (hIL-15). Commenting on TransCure's approach, Dr. Tabruyn said: "Hydrodynamic injection of plasmids encoding human IL-15 allow a transient and physiological level of hIL-15 expression in humanized mice. Typically, one week after the hydrodynamic boost, we observed up to three times more NK cells in peripheral blood. This NK cell increase is stable up to five weeks, providing us sufficient time to engraft tumor cells and test drug efficacy". Although not yet described in publication, hydrodynamic delivery of plasmids encoding cytokines could also be applied to huNOG-EXL mice. Indeed with higher baseline NK cell development and added support from hGM-CSF and hIL3 signals, huNOG-EXL mice may offer important benefits over the huNOG model. Future work will determine the utility of huNOG-EXL for NK cell-related investigations. Two human cytokine-transgenic NOG models have been described to dramatically enhance NK cell differentiation from HSCs. Following HSC engraftment, hIL-2 NOG and hIL-15 NOG develop a human immune system that is nearly entirely NK cells. This robust NK cell development is driven by constitutive expression of each human cytokine. Data reported at AACR 2014 revealed that the NK cell-polarized immune system in HSC-engrafted hIL-2 NOG and hIL-15 NOG results in both models eventually succumbing to wasting disease2. Onset of wasting is significantly delayed in equally-engrafted hIL-2 NOG as compared to hIL-15 NOG, but wasting can be expedited or delayed in both models by titrating the number of HSCs initially engrafted. Delayed onset of wasting disease in HSC-engrafted hIL-2 NOG enhances its utility for ADCC research. Indeed, in vivo tumor suppression by human NK cells in HSC-engrafted hIL-2 NOG mice has been reported in the literature by Katano and colleagues3. Although this report did not address the shortened lifespan in HSC-engrafted hIL-2 NOG mice, the study design and length suggest the lifespan of the model was an important experimental consideration. Rapid onset of wasting disease in HSC-engrafted hIL-15 NOG limits the model's utility, especially for long-term NK cell investigations. At the 2016 International Workshop on Humanized Mice, Dr. Katano presented data from experiments that allowed for longer-term NK cell studies in hIL-15 NOG mice4. These experiments used a modification of Shiokawa and colleagues' system, replacing NOG mice with hIL-15 NOG as recipients for isolated human NK cells4. With the added support of human cytokine signals, human NK cells engrafted into hIL-15 NOG proliferated for an initial four weeks and were maintained up to twenty-four weeks. This approach offers a marked improvement over the one-to-two weeks of NK cell viability in similarly engrafted non-transgenic NOG mice. Although in vivo ADCC studies have yet to be described in this model, Dr. Katano's team did report in vivo anti-tumor activity from NK cells engrafted in hIL-15 NOG. New humanized immune system models are providing improved in vivo systems for studying NK cell biology and related therapies, thereby addressing a growing need for models with sufficient and functional NK cells. Shared among these new models is delivery of human cytokines to support NK cell survival and differentiation. Importantly, the specific cytokines that are delivered and the manner in which they are delivered (e.g. hydrodynamic injection vs. transgenes) influences the resulting NK cell population within a model. Understanding how human cytokines affect NK cells in HIS models will enable investigators to choose models appropriate for their specific research goals. 1. Shiokawa M, Takahashi T, Murakami A, et al. In vivo assay of human NK-dependent ADCC using NOD/SCID/gammac(null) (NOG) mice. Biochem Biophys Res Commun. 2010;399(4):733-7. 2. Mignard C, Mirjolet JF, Duchamp O, et al. Pharmacodynamic evaluation of ADCC mediated effects in humanized IL2 or IL15 NOG mice models. AACR 2014 Meeting Abstract. 2014;10.1158/1538-7445.AM2014-1207. 3. Katano I, Takahashi T, Ito R, et al. Predominant development of mature and functional human NK cells in a novel human IL-2-producing transgenic NOG mouse. J Immunol. 2015;194(7):3513-25. 4. Katano I, Takahashi T, Ito R, et al. Human interleukin-15 transgenic NOG mice support the long-term maintenance of human mature NK cells from peripheral blood. IWHM 2016 Poster.